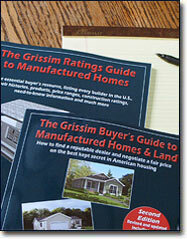 Download a digital edition of The Grissim Ratings Guide (Second edition) and be reading it in less than a minute after your order is processed. The file size is 1.1 megabytes. The book can be saved and accessed on any desktop computer or mobile device that can read the PDF format. A recommended application: Adobe Reader, available free at adobe.com. Pages may be printed on any printer. Save at least $11.00 over the cost of the print edition. 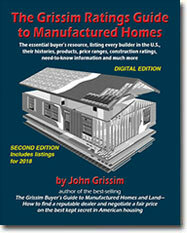 Download a digital edition of The Grissim Buyer's Guide to Manufactured Homes (Second edition) and be reading it in less than a minute after your order is processed. The file size is 2.8 megabytes. The book can be saved and accessed on any desktop computer or mobile device that can read the PDF format. A recommended application: Adobe Reader, available free at adobe.com. Pages may be printed on any printer. Buy the digital editions of both books together for just $31.95 and save $5.95. That’s nearly 300 pages of essential information, product evaluations and no-nonsense insights. 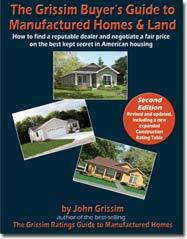 Click on Buy Now to go directly to the book's listing on Amazon.com to complete your purchase. We have chosen PayPal as our secure credit card processor. If you have a PayPal account, you may pay for your purchase that way as well.